Bouncing Buttons crafts making it simple: Holiday season and a bit of smocking. Yes, I do think I am in the middle of a big holiday season. It is Black History Month and American Heart Month. We have had Ground Hog Day, Wear Red Day, the Super bowl (might not be a real holiday but the food and celebration felt like a major holiday), the Olympics, Valentine's Day, Presidents Day, and Chinese New Year. Looking ahead to Fat Tuesday, Mardi Gras, Ash Wednesday and Lent. Add in the bunch of snowstorms and we are having a CRAZY Feb! We don't have this much food, celebration, and excitement in the month of Dec!!! I am exhausted! I have a tummy ache! I don't remember ever eating so much chocolate candy, so many meals out, or this many hot wings in a single month. I always thought Feb. was a cold, sad, and very uneventful month. When I am not eating, playing in the snow, or celebrating I am busy crafting. I admit I am falling way behind on blogging. I will try to catch up this week. Friday I tried smocking for the first time. I was able to find info on how to make the stitches online. 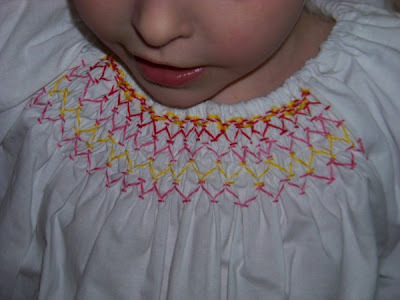 I couldn't find any info on how to take the smocked fabric and turn it into a shirt. Here is a pic of my first try at smocking. I don't have a pleater and I didn't make my pleats by hand. I used my sewing machine. I am sure that must be a big smocking NO NO because after hours of online searching I didn't see anyone write they did this. The only choices I could find was buying pre-pleated items, using a pleater, or doing it by hand. In the pic above my pleating threads are still attached. I have to admit I was afraid to pull out the pleating threads. I thought my baby waves would all come undone if I pulled out my threads. Below is a picture taken after I pulled out all my pleating threads (except for the very top holding row). I was amazed how it all held together after I pulled out the threads! I think it is almost like magic how the fabric feels elastic. After you pull on it, it magically springs back into shape on its own. In the picture above you can see how the smocking is very close to the top and near the edges of the fabric. That ended up being a big headache for me. I didn't have enough room to cut it into a pattern piece! I didn't have enough room to make a traditional shoulder seam. After a few hours of thinking of ways to use my smocked fabric I decided to make it into a simple peasant top. I had to use very thin elastic and a very narrow seam allowance to make it work. In the end this is what I made. I like how it turned out. Demi loves it. I hope my next try my smocking stitches look more lined up. Next time I will try to place my pleats in a better place so I can have more options with choosing a shirt pattern. I think you will be seeing lots of smocked clothing made by me in the future!